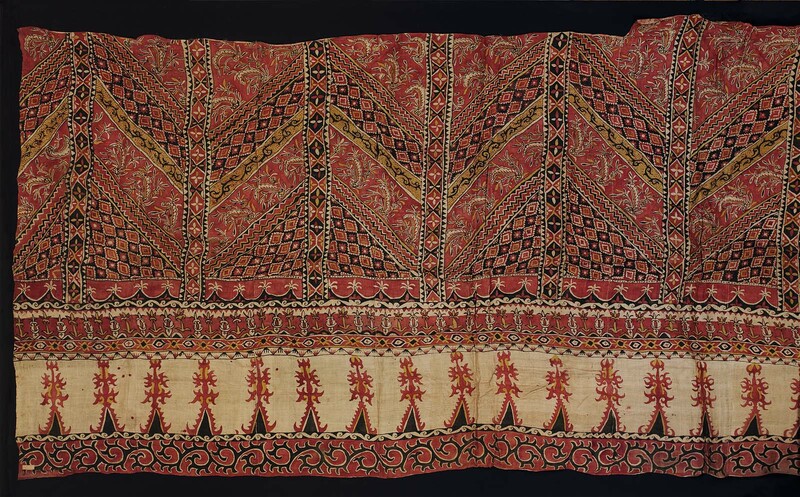 Large abaca cloth created by hand-stitching several pieces together with overall design of zigzag bands filled with stylized floral motifs, deep points, diamonds, rosettes and scrolling arabesques along the border in red, black and yellow on a natural ecru ground; hand-stitched hems. Natural colored hemp on which are painted or printed many borders and panels. The designs consist of scrolls, deep points, diamonds, rosettes and diagonal bands filled with conventional floral ornament. On one end are panels of conventional symmetrical floral ornament. The colors are red, yellow, black and white. This piece may have been used as a bedcover.